The 10 Biggest Muscle Building Mistakes Most People Make In Progressive Overload Weight Training « Burn The Fat Blog – Tom Venuto. “Just lift more weight every time you can” is the routine advice in progressive resistance training programs, but not only is doing that consistently easier said than done, lifting more weight is only one of many overload methods. In fact, obsessing over getting stronger, which is the main advice given by many strength coaches, can actually be one of the biggest mistakes for the bodybuilder or physique athlete. If you’re serious about gaining more muscle and you want to avoid frustrating plateaus and injuries, it’s vital that you understand how to use all of the progressive overload methods and avoid these muscle-growth-killing mistakes. A simple definition of progressive overload is doing more over time. This includes more weight, more reps, more volume, more frequency, more quality, more efficiency or more intensity (of effort). These are all different forms of overload and this increased workload from one workout to the next is fundamentally what triggers muscle growth. Progressive overload is the king of all weight training principles, so the biggest mistake is not using progressive overload at all. This may seem so obvious that no one would overlook it, yet it’s strikingly common and it’s made by newbies as well as seasoned bodybuilders. One reason it’s such an easy mistake to make is that after you’re out of the beginner stage, it becomes increasingly difficult to keep lifting more at every workout. If you’re not well-versed in other methods of overload, it’s not hard to fall into a habit pattern of repeating the same workout with the exact same workload. In fact, many people consider going to the gym and simply getting a workout done a success. That might maintain the shape you’re in, but it’s not enough to produce new gains. If you want to make progress, you must make it a top priority in your training to push yourself and work at a level beyond what you’ve done before. In almost every workout, you must move forward, even if it’s as small a step as just one more rep with the same weight. Most people believe that progressive overload only means increasing the amount of weight you lift over time. This is a major misconception. Lifting heavier and heavier weights is called progressive resistance. Progressive overload is a bigger and broader concept and there are at least eight major types of progressive overload. While progressive resistance is the most well-known type of progressive overload, it’s not the same thing as progressive overload. Once you’ve made this distinction, your eyes are opened to all the other progressive overload weight training methods for building muscle. The more you know how to use, the more power you’ll have to break plateaus and stimulate new muscle growth at will. Progressive resistance is a vital strategy for building muscle. However, when you understand the principle of training specificity, you realize that progressive resistance is not always as big a priority for hypertrophy as it is for strength. In powerlifting and Olympic lifting, strength is the ultimate goal. In physique sports, building muscle and transforming your appearance is the goal. Although being big and strong go hand in hand to a great degree, building muscle and building strength are distinct endeavors. In physique training, an obsessive focus on lifting heavier can actually be a mistake because it’s possible to transform how you look, including gaining muscle size, without always lifting more. An over-emphasis on strength can also lead to frustration, because you can’t keep lifting more weight forever. Beginners can add weight to the bar at almost every workout, and enjoy rapid muscle gains. But the longer you’ve been training, the slower your gains come. When your progress curve stars to flatten and it gets harder to continue increasing your lifts, if the only overload method you use is progressive resistance, you’ll feel stuck. You’ll have no other cards to play, and you may even believe you’ve developed your body as far as it can go. On the other hand, if you learn and use every method of progressive overload, instead of over-emphasizing getting stronger, you’ll discover that you can keep squeezing out more muscle growth for decades and you’ll have the tools to make it happen. Using progressive overload to build muscle is a very slow process that requires long-term perspective and a tremendous amount of discipline and patience. Increasing the weight or overloading in other ways too quickly leads to faster stalls and plateaus that are tougher to break. It also may increase the risk of injuries. Jumping up too quickly in poundage from one workout to the next can also cause your repetitions to fall below your target rep range. If you succeed in increasing the weight but you fail in reaching your repetition goal, that’s not a true progressive overload. Not only does muscle growth happen slowly, your progress rarely occurs in a continuous, straight upward line. Your gains usually come in waves. The waves crest as your body adapts to each new training stimulus or your recovery ability maxes out. Strength and muscle gains can also be unpredictable. Progress sometimes doesn’t even come when your training, nutrition, recovery and lifestyle habits appear perfect, yet may come at times when you least expect it. There are going to be ups and downs. You won’t see muscle gains every week and you won’t increase your lifts at every workout. However, if you stay focused on the long term and diligently apply progressive overload, especially when you’re armed with an arsenal of different overload methods, you can keep making gains for years. If you put too much priority on increasing the weight or if you don’t make weight progressions gradually, your exercise form will tend to slip. Using poor form for the sake of lifting more is only cheating yourself because tension on the target muscle may decrease even when the weight is heavier. Secondary muscles can take over and steal work from the muscle you wanted to grow. Using body momentum, swinging the weight and not controlling the eccentric portion of every rep are also changes in form that could result in less muscle activation. Bad form also increases your risk of injury. Strict form is always important for results and safety, but standardized form is also a must when it comes to quantifying your progression from one workout to the next. If you increase the poundage but your form breaks down – for example, if you shorten the range of motion – you did not achieve true progressive overload. Using progressive overload means that you should always be pursuing personal records (PRs). You won’t hit them every day, but lifting more over time is always one of your goals. On the other hand, the mentality that a PR only means a 1-rep maximum (1RM) is a mistake. Bodybuilding is not powerlifting. Many people with physique goals never even do 1RMs, but they know their PRs for 5 reps, 6, reps 8 reps, 10 reps, 12 reps, 15 reps, even 20 reps or more, and everywhere in between. While the majority of muscle building work is typically done in the 8 to 12 rep range, the latest research suggests that there’s not a single, narrow repetition range ideal for muscle growth. Using multiple rep ranges is more likely the ideal approach to build muscle so progression and PRs should be pursued in all rep ranges. Pursue PRs across all rep ranges, on multiple exercises and even on minor variations of the same exercise including a different stance or grip, a different bar, with or without a belt, with or without a pause between reps, with or without continuous tension and so on. These can all count as separate personal records. PRs in strength come less often as you advance, but if you pursue many different types of PRs, you’ll keep hitting them for years to come and stay incredibly motivated in the process. You cannot accurately and reliably track your training progress without a journal. Most people have a difficult time remembering the weights and reps from their last workout, let alone a month or year ago. Even more important, as it relates to progression, there is no way you can set and achieve the right performance goals for each training session if you don’t remember the sets, reps and weights you did last time. The training journal is an absolutely vital tool for lifters and physique athletes who are serious about making continuous gains. It’s also a tremendous motivational tool. Using progressive overload means increasing your workload over time. That often includes adding volume, not just increasing weights. However, the majority of physique athletes have a deep-seated fear of training too much. Many coaches preach about the so-called dangers of overtraining. They warn their clients and readers that too many sets, too many exercises, too much intensity, too much frequency, too much duration, and so on, will lead to stagnation, burnout or injuries. Overtraining does exist, and adding volume for progressive overload only stays practical and effective up to a point. But most people – especially recreational lifters – are not training anywhere near their capacity, leaving lots of potential to reap untapped gains. Even when you know you’re pushing your work and recovery limits, it’s not always bad to stick your toes over that red line. It’s possible to use periodized training programs that cycle higher and lower levels of volume or intensity, which allow you to successfully train near your limits for a short time before backing off to recover. Most people could also improve their recovery by optimizing sleep, stress management and nutrition. If you don’t at least experiment with increasing your workload as you gain experience and improve your conditioning, then you’ll never really know what growth your body is capable of. Progressive overload encompasses much more than increasing weight. Yes, adding more weight is near the top of the list, and it’s crucial for building a foundation in the beginning. But indeed, we must accept the fact that we can’t increase the weight at every workout, that the more years of experience we gain, the harder it will be to add more weight, and that at a certain age, we are less likely to break lifetime personal lifting records. The good news is, during those times when you can’t increase the poundage yet, you can use the other overload methods which include more reps, more volume, more frequency, more intensity, more quality and more efficiency. If you study and use all of these progression systems and choose the best ones given your circumstances, you’ll be amazed how you can still make every workout progressive at least in some small way, and you can continuously improve your physique for many years to come. Progressive overload is the king of training principles and the key that unlocks the door to continuous muscle gains. 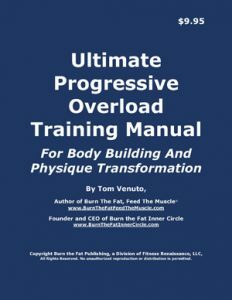 My Ultimate Progressive Overload Training Manual is the first complete book ever written on how to use this master key to muscle growth. Click Here and and pick up your copy today! Great and very useful read! I have to admit I did few of these when I first started, I learned the hard way. Thanks for sharing!